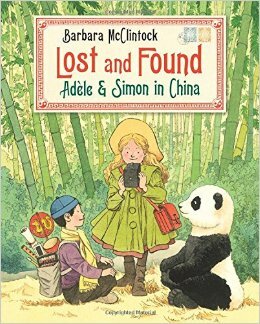 For sheer breathtaking scenic beauty Barbara McClintock’s painstaking Lost and Found: Adele & Simon in China is as ravishing a picture book as any released in 2016, but as is invariably always the case with her meticulously detailed and annotated works there is so much more on display. Though the renowned veteran author-illustrator has won a brace of awards and critical praise through her prolific career the American Library Association’s Caldecott committee has yet to honor one of her books with their signature gold or silver medal, though many times she was no doubt exceedingly close. A few years back her exquisite collaboration with Jim Aylesworth, My Grandfather’s Coat garnered considerable buzz in on-line Caldecott discussions, that same year’s charming Where’s Mommy?, a follow up to the classic Mary and the Mouse, the Mouse and Mary landed on on numerous year-end best lists, and her sublime Dahlia several years back was recipient to a plethora of citations. Possessing a discerning sensibility the artist has completed many fairy tale interpretations, a number of which are the most magnificent covers of some of those works to date. The elusive Caldecott may well be attributed to intense competition at the wrong time or just some plain old bad luck, but either way this is truly unfortunate situation.